After having published his book Dispersion of Meaning - The Fading Out of the Doctrinaire World? 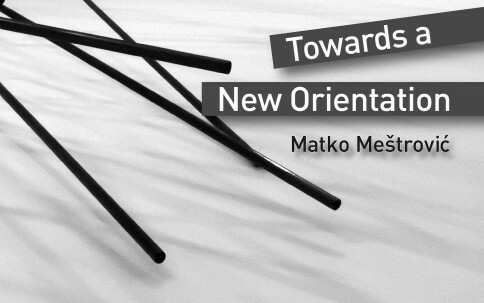 (2008), the same publisher CSP - Cambridge Scholars Publishing has just published a collection of nine inter-linked essays by Matko Meštrović under the title Towards a New Orientation. A Croatian version of the book, Prema novom usmjerenju, was published by Zagreb publisher Antibarbarus. Mixing theoretical, empirical and normative insights, utilising inter-disciplinary or, more accurately, post-disciplinary modes of reasoning, Meštrović traces the current imbalance between market globalisation and globalised modes of sociability as a consequence of central contradictions within the current capitalist mode of production, not only between capital and labour but between capital and society and, indeed, capital and culture. A Croatian version of the book, Prema novom usmjerenju, was published a year earlier by Zagreb publisher Antibarbarus.